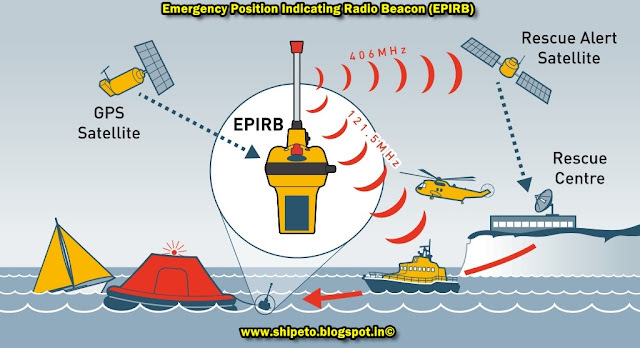 EPIRB is a float free radio transmitter which when activated will emit a distinctive radio signal to satellite to determine its position and its identify. The purpose of EPIRB is to help determine the position of survivors during SAR (Search and Rescue) operation and also a secondary means of distress alerting. It indicates one or more persons are in distress, may no longer be onboard ship or aircraft and receiving facilities may not be available. Cospas Sarsat EPIRB, -406.025MHz with 121.5MHz homing signal which is the most common EPIRB. VHF EPIRB – (Ch. 70 DSC) – found very rarely and only onboard vessels plying A 1 area. L band EPIRB – 1.6Hz (operates with Inmarset E system) – not in use now. Cospas Sarsat EPIRB system consists of Six Polar orbiting LEOSAR (Low Earth Orbiting Search And Rescue satelites) situated at a height of 800 to 1200 km. EPIRB are normally fitted on the bridge with HRU for float free/automatic operation. When the EPIRB sinks 1.5 to 4m below water level. It gets automatically released and floats free and gets activated when it’s two terminals come in contact with water. If necessary EPIRB can be hand carried to survival craft before abandoning vessel and operated manually. When activated manually or automatically, EPIRB transmits signal (burst of 0.5 sec repeated every 50 secs with a visual indication by a strobe light). These signals when detected by cospas sarsat satelites are relayed to LUT. LUT process these signals and determines the position of EPIRB by Doppler shift and conveys the information to MRCC and SAR vessels via MCC. MCC is mission control centre where the EPIRBs are registered and particulars of vessel to which the EPIRB belongs can be obtained. MRCC IS Maritime rescue coordination center which co ordinates SAR operation. In India LUTs are situated in Bangalore and Lucknow. Real time mode – When EPIRB and LUT are in the sight of the satellite the EPIRB signal is relayed on receipt. Global mode – When LUT is not in sight of satellite when EPIRB signal is picked up by satellite, then the information is stored in satellite and transmitted when LUT comes on sight. This is called global mode. The time delay in detection and relaying of EPIRB transmission in Global mode can be up to 1 hour. With recent addition of 5 GEOSAR Geo stationary revolving at a height of 36000km into the COSPAS SARSAT system, instantaneous detection of EPIRB signal is possible now, if the EPIRB is fitted with built in GPS. As per SOLAS every vessel is required to carry at least one EPIRB. But as per DGS requirements Indian flag vessels need to carry two EPIRBs. Battery used for EPIRB is 18v Lithium battery & have very long self life of 5 years or more (very less sels discharge). The capacity of lithium battery should be enough to lost for 48 hours when activated. EPIRB battery should be replaced before its expiry date or within three years of installation. EPIRB is to be tested every month for operation and condition. Test the operation of EPIRB by moving the spring loaded operating lever switch to test mode and if look for the visual indication (LED and flashing strobe light).